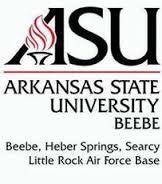 Arkansas State University-Beebe is a regional state university that is an operationally separate, two-year institution of the Arkansas State University System. With campuses located in Beebe, Heber Springs, Searcy, and Little Rock Air Force Base, we offer associate degrees, certificates, and non-credit training for business and industry. The Beebe campus also collaborates with ASU-Jonesboro to offer baccalaureate and graduate degrees on the Beebe campus. Courses are also offered at additional locations within our service area, and many courses are taught in locations convenient to business and industry.